The Buzzer – drone funding @thebuzzerco #makerbusiness « Adafruit Industries – Makers, hackers, artists, designers and engineers! The Buzzer‘s latest newsletter is intense! 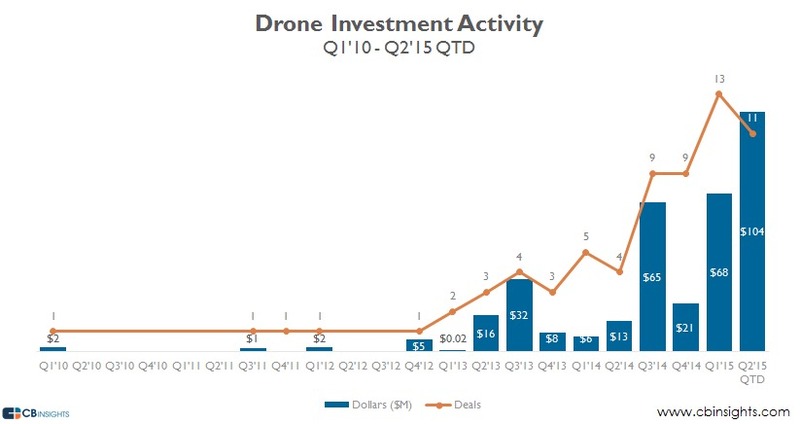 Startup-industry analysis firm CB Insights released a digest of drone funding claiming that the first half of 2015 has netted over $172M in funding for drone-related companies — that’s more than the last 3 years’ worth of funding, combined. The first thing that should jump out is the discrepancy between U.S. based 3D Robotics and their Chinese rival, DJI. Both companies are careful with the numbers they choose to release, but with DJI’s reported $10B (with a B) valuation on their latest round, roughly half a billion in sales last year, and the lion’s share of FAA exemptions, their performance is impressive given how little money they’ve apparently raised, no doubt bolstered by surging revenues and an HQ in China.